Periodontal (gum) disease is potentially devastating to your teeth, gums and bone. To fight it we have to remove the substance that causes and sustains the disease from all oral surfaces — a thin layer of bacteria and food particles known as plaque. To accomplish this task, we use a variety of hand instruments called scalers to mechanically remove plaque and calculus (hardened plaque deposits), as well as ultrasonic equipment to vibrate plaque loose and flush it away with water. If we detect plaque deposits well below the gum line and around the tooth roots, we may need to use other techniques like root planing or surgery to access these deeper areas. Â While gum disease is persistent and aggressive, these traditional techniques have proven quite effective in controlling the infection and restoring health to diseased gums. 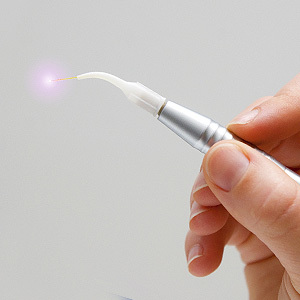 Yet like other aspects of medicine and dentistry, technological advances have created a new option for gum disease treatment: the Nd:YAG laser. The Nd:YAG laser is named for the crystal it uses to produce a narrow and intense beam of light on a specific frequency. In recent years it's become an important surgical tool because it can distinguish between diseased and healthy tissue, destroying the former while not affecting the latter.Â It's being used now on a limited basis for treating gum disease, especially for removing infected tissue in deep pockets that can form below the gum line, and for removing plaque and calculus from root surfaces. Â Because of its precision, early evidence of effectiveness is encouraging: minimal tissue damage and swelling, less bleeding and reduced patient discomfort after treatment. The heat from the laser has also been shown to kill bacteria and essentially sterilize the area. Still, the findings aren't conclusive enough as to whether lasers are superior in most circumstances to traditional scaling methods. For the time being, we'll continue to use the tried and true methods for removing plaque and calculus. But as laser technology advances, the time may come when this new approach to gum disease treatment will become a more prominent and beneficial option for patients.